There are two kinds of directors: those who have the public in mind when they conceive and make their films and those who don't consider the public at all. For the former, cinema is an art of spectacle; for the latter, it is an individual adventure. There is nothing intrinsically better about one or the other; it's simply a matter of different approaches. For Hitchcock, films are meant for the public. He made movies for the public. Alfred Hitchcock, often dubbed as the master of suspense, is a remarkably intelligent director. Right from the start of his career in England, he had formed the habit of predicting each aspect of his films. All his life he has worked to make his own tastes coincide with the public's, emphasizing humor in his English period and suspense in his American period. 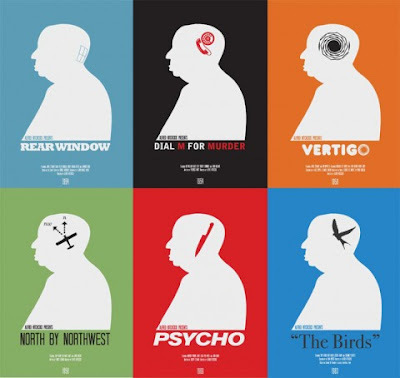 This dosage of humor and suspense has made Hitchcock one of the most commercial directors in the world. It is the strict demands he makes on himself and on his art that have made him a great director. On the length of movies: "The length of a film should be directly related to the endurance of the human bladder"
"to simply scare the hell out of people." In the following video, the master of suspense describes his "Theory of Bomb" that lies at the heart of his filmmaking style. In yet another video, posted below, Hitchcock defines the idea of a McGuffin, a ploy by the director to sustain the suspense, first introduced by Hitchcock. Overview: Hitchcock in full gear, telling story of London strangler and innocent man suspected of murder spree. All Hitchcock elements are here, including black humor and several astounding camera shots. Overview: Walker gives his finest performance as psychopath involved with tennis star Granger in 'exchange murders'. First - class Hitchcock, based on a novel by Patricia Highsmith. Overview: Frederick Knott's suspence play of man plotting wife's murder and subsequent police investigation; stagey at times but slick and entertaining. Overview: One of Hitchcocks most stylish thrillers has photographer Stewart confined to his wheelchair in his apartment, using binoculars to spy on the neighbors, and discovering a possible murder. Overview: The French Riviera serves as a picturesque backdrop for this entertaining Hitchcock with Grant as reformed cat burglar suspected in new wave of jewel robberies. Overview: Hitchcock's remake of his 1934 film is disappointing. Doris Day's "Que Sera Sera" won the Best Song Oscar. Overview: One of Hitchcock's most discussed films. Retired police detective who has fear of heights, is hired by old school friend to keep an eye on his wife, eventually falls in love with her and that's just the beginning. Haunting, dream - like thriller. Overview: Quintessential Hitchcock comedy - thriller, with bewildering ad - man Grant chased cross country by spies (who think he is a double agent). One memorable scene after another. Overview: The master's most notorious film is still terrifying after all these years. Overview: Hitchcock's classic about a woman and mass bird attacks that follow her around isolated California community. Overview: This story of a habitual thief whose employer is determined to understand her illness was considered a misfire in 1964 but there's more than meets the eye. Overview: French Intelligence agent works with American to dig out info on Russia's involvement in Cuba. Good but also not a great Hitchcock. Overview: Hitchcock's first American movie about a girl who marries British nobleman but lives shadow of his former wife. Academy Award winner for "Best picture" and "Cinematography". Overview: Perceptive Americana intertwined with story of young girl who slowely comes to realize her beloved uncle is really the "merry widow murderer". Overview: Young girl is kidnapped to prevent her parents from revealing what they've learned about assassination plot. Overview: Classic Hitchcock mystery with overtones of light comedy and romance, as innocent Donat is pulled into spy - ring activities. Hitchcock used the theory of proximity, by "proper" placement of camera to plan out each scene. These varations are a way of controlling when the audience feels intensity, or relaxation. Hitchcock compared this to a composer writing a music score - except instead of playing instruments, he's playing the audience. Hitchcock said the following: "People don’t always express their inner thoughts to one another," said Hitchcock, "a conversation may be quite trivial, but often the eyes will reveal what a person thinks or needs.” The focus of the scene should never be on what the characters are actually saying. Have something else going on. Resort to dialogue only when it’s impossible to do otherwise. In other words we don’t have pages to fill, or pages from a typewriter to fill, we have a rectangular screen in a movie house." Putting an idea into the mind of the character without explaining it in dialogue is done by using a point-of-view shot sequence. This is subjective cinema. You take the eyes of the characters and add something for them to look at. You can edit back and forth between the character and the subject as many times as you want to build tension. The audience won't get bored. This is the most powerful form of cinema, even more important than acting. This is what Hitchcock calls "pure cinema. Divide action into a series of close-ups (Montage editing) shown in succession. Don't avoid this basic technique. This is not the same as throwing together random shots into a fight sequence to create confusion. Instead, carfully chose a close-up of a hand, an arm, a face, a gun falling to the floor - tie them all together to tell a story. In this way you can portray an event by showing various pieces of it and having control over the timing. You can also hide parts of the event so that the mind of the audience is engaged. Hitchcock said this was "transferring the menace from the screen into the mind of the audience." The famous shower scene in Psycho uses montage to hide the violence. You never see the knife hitting Janet Leigh. The impression of violence is done with quick editing, and the killing takes place inside the viewer's head rather than the screen. Also important is knowing when not to cut. Basic rule: anytime something important happens, show it in a close-up. Make sure the audience can see it. Make all of your characters the exact opposite of what the audience expects in a movie. Turn dumb blondes into smart blondes, give the Cuban guy a French accent, and the criminals must be rich and successful. They should have unexpected personalities, making decisions on a whim rather than what previous buildup would suggest. These sort of ironic characters make them more realistic to the audience, and much more ripe for something to happen to them. Hitchcock criminals tend to be wealthy upper class citizens whom you’d never suspect, the policeman and politicians are usually the bumbling fools, the innocent are accused, and the villains get away with everything because nobody suspects them. They surprise you at every step of the plot. 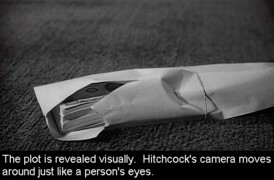 "Information" is essential to Hitchcock suspense; showing the audience what the characters don’t see. If something is about to harm the characters, show it at beginning of the scene and let the scene play out as normal. Constant reminders of this looming danger will build suspense. But remember - the suspense is not in the mind of the character. They must be completely unaware of it. Create situations of irony. 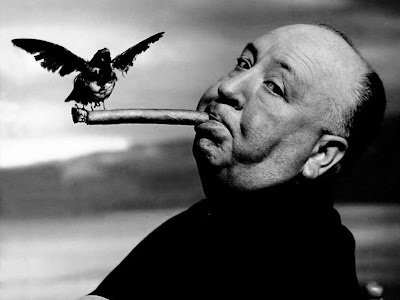 While working on a screenplay Hitchcock would often ask, “Now wouldn’t this be a funny way to kill him off?” He built his stories around ironic situations. He liked to play practical jokes on the characters, putting them through the worst possible things that could go wrong. In the Alfred Hitchcock Presents episode "One More Mile to Go" (1957, directed by Hitchcock) a policeman has stopped a man because of a burnt out tail light on his car, completely unaware there is a dead body in the trunk. The more obsessed this policeman gets with fixing the light, the more uneasy the murderer gets. Hitchcock pushes this situation to the level of unbearable absurdity as the policeman continues worrying about the light, and gets closer and closer to noticing the body. North By Northwest (1959) places Cary Grant in an open field on a sunny day, where he is then chased by an airplane. “I like to take a lurid situation and counterpoint it with understatement,” explained Hitchcock. Finally Truffaut said of Hitchcock the following: "Hitchcock has long been judged by the flowers he places in the vase. Now we have at least realized that the flowers are always the same, and that his efforts are directed at the shape of the vase and its beauty."